Cut yarn, leaving a good length tail to sew, draw through stitches on needle, then sew up side seam. 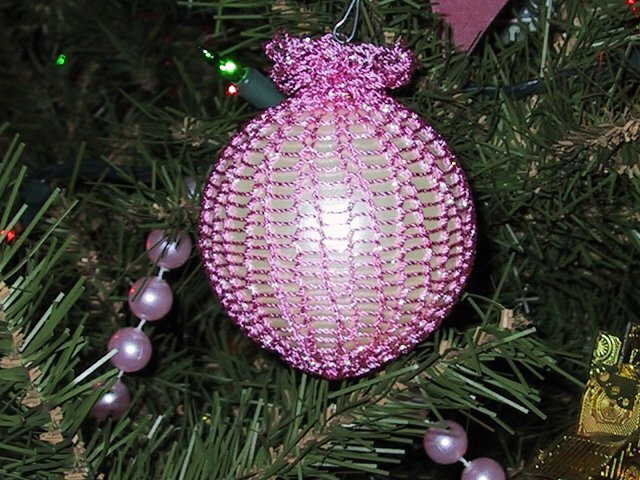 Insert ornament ball into mesh pouch, leaving a �puff� of fabric at top, and sew around base of top hanger part, gathering up the top and snugging it to close. Secure end in, and then either flare or pouf the top fabric, or roll it down over the sewed top gather, whichever you prefer. 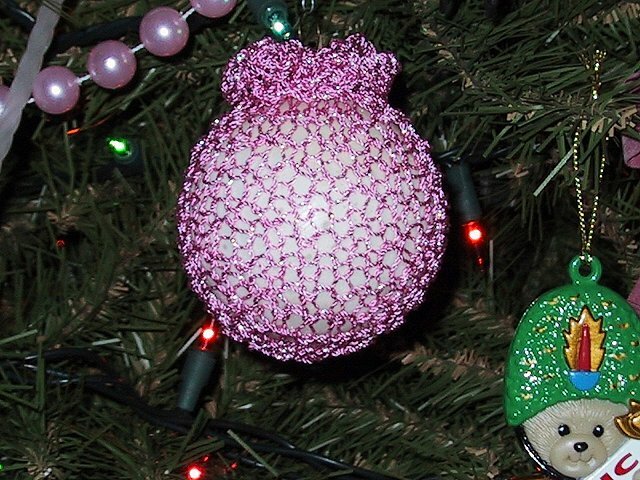 As I was handknitting the ornaments above with metallic nylon thread stuff to make mesh ornament covers to go over the unbreakable ball ornaments, I realized this could be a perfect thing to use my Barbie Knit Hits machine for. So I dug it out of storage and gave it a try, and it worked beautifully! You could also use a manual circular knitting loom of about the same size, about 3-4" across. I simply knit up a tube, cinched one end closed, inserted the ornament, and gathered the top edge, leaving a "pouf" of fabric around the top, covering the hanger part. 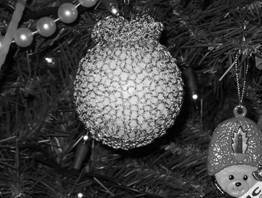 After trying it both directions, I turned it inside out since I liked the "bumpy" purl side showing more than the smooth "v" side for ornaments. Just a thought for those of you with these machines for simple gifts to make with them.